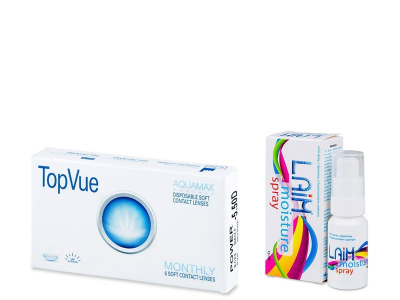 This package contains six TopVue Bi-weekly contact lenses and a 15 ml bottle of Laim Moisture Spray. These hydrogel lenses are equipped with sodium hyaluronate, which provides exceptional moisture and comfort. TopVue Bi-weekly are comfortable, well-tolerated hydrogel lenses with sodium hyaluronate, an extraordinarily effective lubricant. Additionally, the PEG (polyethylenglycol) wetting agent ensures hydration and comfort throughout the day. Sodium hyaluronate, or hyaluronic acid, is a substance natural to the human body. It can be found in joint fluid and the eyeball. 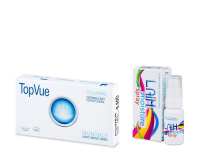 The parameters of TopVue contact lenses suit 99% of users. LAIM Moisture Eye Spray stabilises the lipid layer of the tear film, enhances eye and eyelid lubrication and ensures comfort for users of soft hydrogels and silicone hydrogel contact lenses. The product is suitable for all contact lens wearers, but it is also used for the treatment of dry eye condition and insufficient build-up of the lipid layer. It contains an outstanding wetting agent, sodium hyaluronate, and it is scented with chamomile extract. The moisture spray was a great bonus. I'll definitely order again.